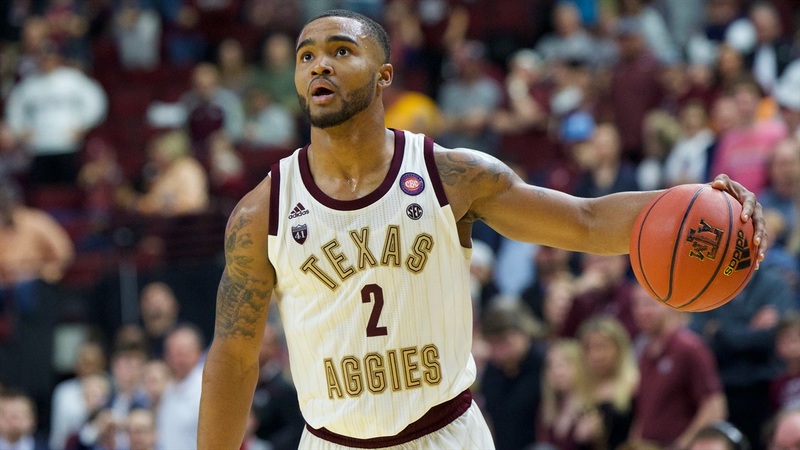 A big key for Texas A&M to end a six-game Southeastern Conference basketball losing streak may be getting more than six minutes from T.J. Starks. Starks, A&M’s leading scorer, was benched after only six minutes of a 75-71 loss to Ole Miss on Wednesday because of lack of effort. The Aggies (8-13, 1-8) likely will need a strong effort from Starks — and everybody else — to end their skid when they face Missouri (11-10, 2-7) at 5 p.m. in Columbia, Mo. A&M forward Josh Nebo, is questionable for Saturday’s game at Mizzou. A&M might be without junior forward Josh Nebo, who has emerged as perhaps the best player on both ends of the court. Nebo has not practiced since the Ole Miss game and Kennedy said he hopes Nebo is available against the Tigers. That would seem to further underline the importance of getting Starks back in the lineup and playing effectively. Starks missed his only shot and committed two turnovers against Ole Miss, but coach Billy Kennedy insisted that wasn’t why he took the sophomore guard out of the game. Kennedy did not say whether Starks would be back in the starting lineup but confirmed he would play against Missouri. Starks was also yanked early on Jan. 19 in a previous clash with Missouri, in which the Aggies offense was abysmal in a 66-43 loss. Starks managed only two points in that game, but he was hardly alone in his ineffectiveness. A&M made just 13 shots while shooting 26 percent overall in that game. The Aggies converted only 4 of 22 attempts from 3-point range. A&M has made recent offensive strides. The Aggies have hit 23 treys in the last two games with Brandon Mahan making 11 of 13. In contrast, Missouri has experience recent struggles from behind the arc. Missouri, which has lost three of its last four, remains one of the SEC’s best from 3-point range despite shooting just 28.8 percent (28 of 97) in the last four games. A big reason for that decline in productivity is the loss of guard Mark Smith, who’s been sidelined with a sprained left ankle. Smith leads the Tigers with 48 treys and boasts an SEC-best 47.5 shooting percentage from 3-point range. Though Smith’s absence has hurt, Missouri still has a 3-point threat in guard Jordan Geist, who leads the Tigers in scoring at 13.7 points per game. Geist had 17 points and four 3-pointers in a 66-43 victory over A&M at Reed Arena on Jan. 19. Smith also had 13 points and three treys in that game.